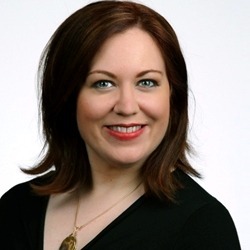 Lynette Young is a social media and digital marketing strategist, CEO of Purple Stripe Productions, founder and curator of Women of Google+, and author of Google+ for Small Businesses. She's also one of the most followed people on Google+, with 1.5 million followers. I invited Lynette to Marketing Smarts to talk about why businesses should be on Google+, and how brands can use that social network for marketing. We covered everything from how Google+ differs from Facebook to how big companies can set themselves up as "publishers" so that the content their employees create for the company blog boosts search engine rankings. Marketers should explore what Google+ has to offer (01:36): "First of all, it's Google, It's not a startup...piece of software/app. They've got some money, they've got some talent and engineers behind it. The second thing is the complete structure of the data—how Google+ works, how the communities and the people and the conversations work on the platform—is exactly opposite of how Facebook is structured. People look at it on the surface and say, 'well, I can post content, I can make events, I can connect with people, share, like, friend, that sort of thing,' which on the surface most social networks can do, but when you take a deeper look...[at] the tech side of Google+, [you] realize that...when you put content or have public communications or connect with people on Google+ in a public way, those pieces of content, those connections, and conversations live on the Internet forever. The longer a piece of content exists on Google+, the more likely it is to get found and you to get connected through it. That is exactly the opposite of how Facebook works. The longer a piece of content exists on Facebook, the less likely it is to get found." Google+ drives significant traffic to older posts, and it enables you to keep that content updated (04:30): "The nice thing about Google+ is that I've found, nearly three years later, I've had some of the very first posts that I put on the platform still generate...50 views a week on my blog or whatever property that they point to. I don't know if I've had a Facebook post or content still drive traffic three years later. The cool thing is that when that content becomes slightly stale on Google+, or it's out of date, or there's new numbers to include, you can modify that content, edit it, and keep it up to date very easily." Authorship's not just for individual content creators; big companies that have a content team can set themselves up as publishers on Google (08:55): "The problem [with Google authorship] arises when you're not an independent blogger or content producer. You're a large group of digital content providers and you're doing videos and you're doing podcasts and you're doing text-based content or graphical-based content. How do you get that all in? There's something in Schema called publisher. I can say 'I am a publishing entity, I've got MarketingProfs, I've got Mashable...Forbes.com; these are publisher entities. That's really at the enterprise level of claiming your data, claiming your information online, compiling all of your authors underneath you. It can get technical, which is why I think that a lot of people in marketing and PR shy away from this, because...you have to have the technical chops or the understanding to get it done.... When you're an entity that has multiple website properties, or multiple physical locations, or check-in points, it becomes very messy, but...once it's done... the benefits just ripple. It's outside of social. It's the entire Internet at this point. When you look at authorship and publishing statuses and get your schema up to date, it's not just in the ecosystem of Google+, the way that your work in Facebook would be, it goes so much bigger. You really have to think of it as an Internetwide tactic, and not just a social tactic." For more information, visit LynetteYoung.com, PurpleStripe.com, or follow Lynette on Twitter: @LynetteRadio. Lynette and I covered a lot more ground, so be sure to listen to the entire show, which you can do above, or download the mp3 and listen at your convenience. Of course, you can also subscribe to the Marketing Smarts podcast in iTunes or via RSS and never miss an episode! Lynette Young, CEO of Purple Stripe Productions, founder and curator of Women of Google+, and author of Google+ for Small Business.